Note: This is a pre-scheduled post. I am still on vacation. Apologies for any delay in commenting back! This is part of the small list of books I read in preparation for my trip to Japan this year. The Peony Lantern follows the life of a commoner turned lady in waiting in 1800s Japan. It makes for a breezy, yet somewhat forgettable read. The tale is penned by an Australian author, yet the research into traditional Japanese culture is sound. This is a great first look for any teenagers interested in Japanese history. I think where this book excelled was definitely in the research into Japanese culture. In fact, The Peony Lantern was less book and more a love letter to Japan. I could feel that the author was enamoured with the country (a sentiment I share!). You can read all about the research Ms Watts did for the book here. The story carries us through a full year, letting the reader experience a piece of Japan’s love for seasonal changes and celebration. It starts at the beginning of summer, evocative in its imagery of the rain season (called tsuyu). The book then follows through to those muggy summer days, vibrant with the colours of irises, hydrangeas and firework. We then get the luscious autumn scenes, dressed up in gold and reds through chrysanthemum and maple leaves. Finally, we get the intimacy and mystery of snowy winter; seen through frost and steaming bowls of oden. Through Kasumi’s inexperienced eyes, the readers also get to see her first glimpse at ikebana, painting, and ukiyo-e. The book is a crash course in all that foreigners celebrate about Japanese culture. You know: geisha, sashimi, beautiful sweets and tea ceremonies. 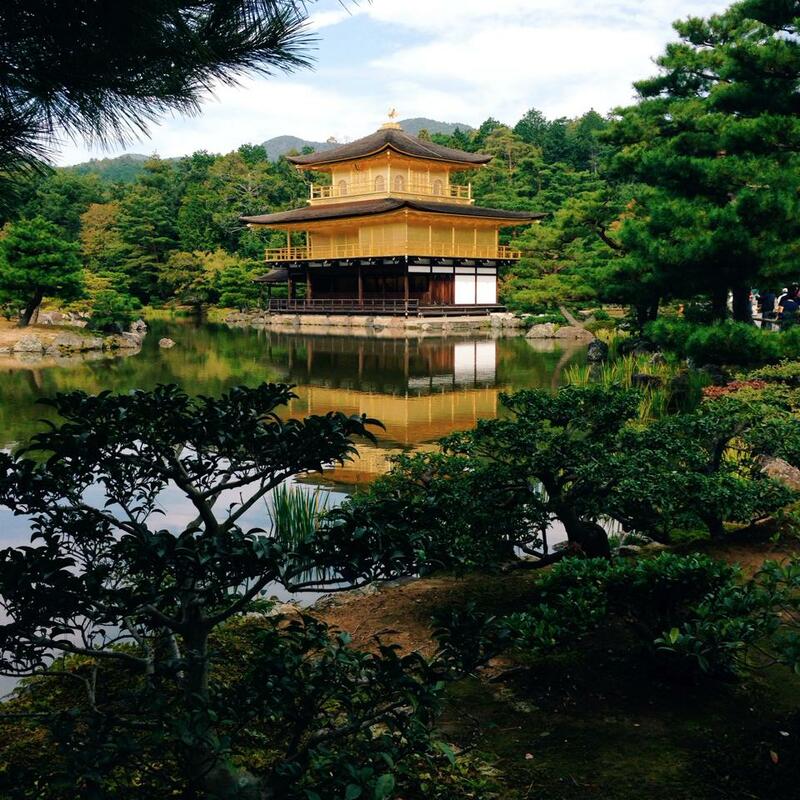 However, I did not get the sense that the author was misappropriating the culture – just that she loved Japan very much and wanted to share her experiences. My knowledge of the Japanese culture is limited to my short holidays there and specialised books or website – yet from what I could surmise, the information conveyed were accurate. Unfortunately, in the book’s zeal to display Japan and all its many faces – it forgot its human characters somewhere along the way. While Edo was a character unto itself, the same cannot be said for Kasumi, Misaki, and the rest of the cast. Kasumi, our main character, was an bland vessel through which the reader viewed Japan. She never lifted off the page and became a real person. Kasumi’s conflicts felt like a check box of: love interest, ‘passion’ in painting, and her relationship with her mistress, Misaki. While Kasumi’s father touted her as the disobedient and free-spirited child – she sadly did not live up to his snide remarks. All I learned of her was a sleepy curiousity and a love for art of all kind – both a necessity of the plot. I did find her mistress, Misaki, a lot more engaging, as was the mystery surrounding her. However, given the neo-Confucian societal structure of Edo Japan, I find her situation quite farfetched. I don’t want to risk spoiling the ending for those interested to check out the book – but needless to say, it is wishful thinking. The actual story itself is a part mystery and part political intrigue, however – there was not enough content or investment on the heroine’s part to make the storyline engaging. 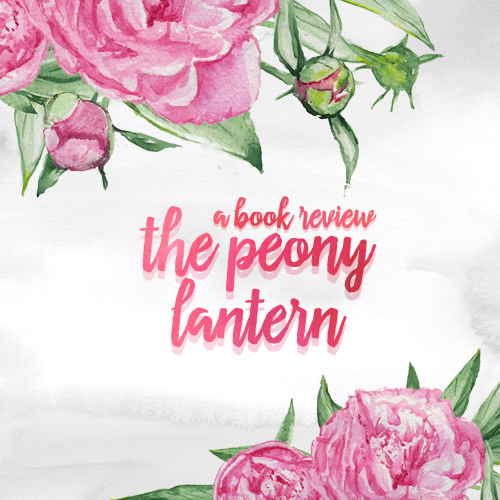 I did enjoy the fact that the story is a loose retelling of the Japanese Ghost Tale: The Peony Lantern – the reimagining has a great feminist spin that I appreciated! I would say that this book is 60% a crash course in Japan culture, and maybe 40% plot. Take that as you will, though I personally enjoyed it because my main draw to this story was Japan. As I did during my previous posts, included in this post are photos of my travel, in relation to this book! We left the Kiso Valley. I had thought I’d be sad as we moved further and further away from my home, and I was a little, but more than that I was entranced, my eyes travelling over new landscapes: the sight of the sacred Mount Fuji from the Shiojiri pass; the bleakness of the Asama plateau, so wide and flat, the desolate air broken by the porters from Oiwake singing a song about the inn of the moon and flowers. Then Mount Asama, the mighty volcano, so unlike the comforting embrace of the mountains in my valley. I saw lakes and bustling towns and the grand Korigawa shrine, and crossed a wide river on a ferry boat: my first time on the water. ‘Tell me about Hakone,’ I urged. Her expression became rapturous. ‘It was so beautiful, Kasumi — I wish you could have seen it.’ She described the blazing autumn colours of the forested hills, the view across the lake to the sacred peak of Mount Fuji. I didn’t pass through the Kiso Valley region in Japan, so my journey was a little different to Kasumi’s own. I did attempt to glimpse at Mt Fuji by traveling through Hakone. Unfortunately, I did not get to see the elusive Mt Fuji – the sky was clear and blue everywhere BUT over the mountain top! Damn you, condensation laws and physics! 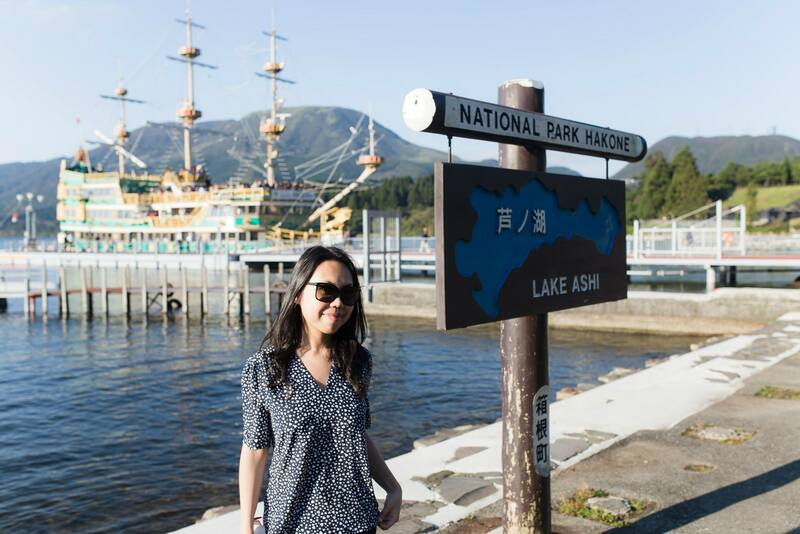 However, like Kasumi, I did get to travel on a ferry across Lake Ashi – which was stunning. 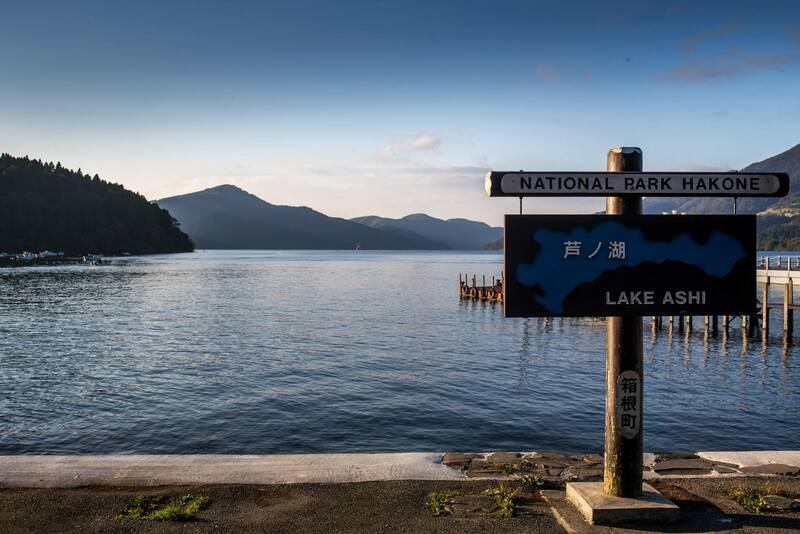 It was liberating seeing the azure sky, emerald mountains, and open water – especially after spending a week in the concrete metropolis of Tokyo. ‘I know. They boil it in the hot springs and it turns the shell black. But eating it will bring you seven years of good luck.’ ‘Thank you.’ I cradled the egg in my palm, touched that Misaki had thought of me on her travels. What would seven years of good luck mean for me? 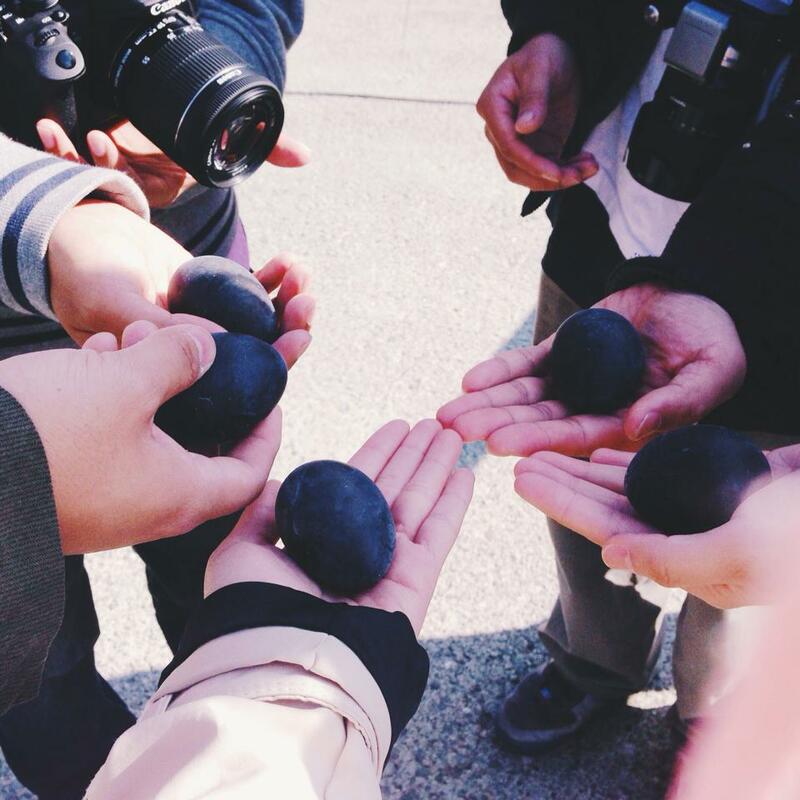 I also had the famed blackened eggs at Owakudani valley in Hakone. Misaki is right, they are touted to increase longevity – although once cracked they’re just ordinary boiled eggs. I remember this batch of 5 costing us 700Y! There are also many other gimmicky foods sold in this area: such as black ramen and egg flavoured ice cream – I was not brave enough to try either, so I cannot report on their taste! A series of stepping stones led to a small stone bridge, which we crossed into a cool glade of ferns, at its centre a large stone lantern covered with moss… Whoever had designed the garden had ensured there was a colour for every season, I noted. It was like the world in miniature. The gardens in Japan are resplendent, each plant carefully curated to mimic nature. My favourite is the garden surrounding Kinkakuji: The Golden Pavilion. The temple lies in a middle of a completely still pond, filled with koi fish. There are numerous little rocky islands in the pond, rumoured to represent Japan’s many islands. It’s a beautiful space for quiet contemplation, if you could ignore the gaggle of tourists behind you. It took me ten minutes to get this particular shot, this temple is so popular it would be packed whatever time of day you arrive – but the view is completely worth it. I am also going to visit Kenrokuen and Korakuen when I go back to Japan this year. They are famed to be 2 of the 3 leading gardens in Japan, so I will be sure to share photos if I am able to get reliable wifi! Ahhh!! Your vacation seems so awesome! And this book… Well, it doesn’t seem as amazing because of the characters not being as well-developed as the reserch was. At least the cultural aspect was well-done. I’ll check this out! I love that the book has so much culture! It’s a shame though about the characters not being that strong. You know how much I need to connect with characters, so I’d probably struggle with this one. Those black eggs look so interesting. But egg ice-cream? That doesn’t sound very appealing! I’m the exact same, Nick! I also need to be able to connect to characters first and foremost! The black eggs are just ordinary boiled eggs once you peel the shells ahaha — I was too scared to try egg ice cream cos O_o! !